Engineering Dynamics and Vibration are two foundation areas in many engineering fields. They are fundamental to the analysis and design of many dynamic engineering systems. 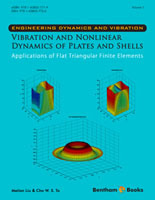 The present volume, Vibration and Nonlinear Dynamics of Plates and Shells: Applications of Flat Triangular Finite Elements is a timely and unique addition to the literature in the two foundation areas in engineering. The authors, Professors Meilan Liu and C.W. Solomon To, have a combined experience of more than fifty years in the engineering dynamics and vibration analysis of plate and shell structures. The present volume has included the two foundation areas in a single book that applies the lower order flat triangular shell finite elements originated from their early research. Its main and important feature is the combination of vibration and nonlinear dynamics of plates and shells in a relatively comprehensive treatment employing the finite element method. Another feature of the present volume is the treatment of boxed or cell structures. It is believed that anyone working in the analysis and design of dynamic engineering systems will find it informative and an excellent reference. The germ of this eBook was grown from the interests of the authors in engineering vibration and dynamics. The theoretical background and computational techniques adopted throughout this eBook were based on part of the doctoral degree thesis of the first author. While the fields of computational engineering dynamics and vibration are vast, and their applications have virtually no limits, the scope of the present eBook is confined to vibration and nonlinear dynamics of plates and shells. For computational studies, the versatile finite element method alone provides a multitude of impressive publications, such as the pioneered work, Finite Element Handbook published in 1987 by McGraw-Hill (Editor-in-Chief, H. Kardestunder and Project Editor, D. H. Norrie). Subsequently, there are various handbooks in finite element methods available in the literature. Thus, the subject matter and topics included in the present eBook are focused on the vibration and nonlinear dynamics aspects of plate and shell structures. While finite element analysis of plates and shells is generally regarded as a mature technology it seems that no single book that covers both vibration and nonlinear dynamics by applying the finite element method is currently available. Consequently, the present volume is a modest attempt to provide such a book, albeit a relatively limited one. The particular shell finite elements employed in the computational studies reported in this book are the mixed formulation based lower order flat triangular shell finite elements. The present book has nine chapters. The brief introduction is included in Chapter 1. Chapter 2 is concerned with the theoretical background for the vibration analysis of plates and shells. In particular, the mixed formulation based three-node flat triangular shell elements are presented in this chapter. Vibration analysis of plate structures is considered in Chapter 3. In the latter the square, circular, and skew plates as well as membrane are treated. Vibration analysis of shells with single curvature is presented in Chapter 4 in which cylindrical panel with rectangular and trapezoidal projections, Scordelis-Lo roof, and cylindrical shell clamped at both ends with its effect of aspect ratio are included. Chapter 5 is concerned with the vibration analysis of shells of double curvatures. These structures include the spherical caps, spherical panel of square projection, hemispherical panel, and clamped hemispherical shell. Chapter 6 deals with the vibration analysis of box structures. Single-cell and double-cell box structures are studied. Chapter 7 provides the theoretical development for the nonlinear dynamic analysis of plate and shell structures. The focus is on the mixed formulation based three-node flat triangular shell elements for nonlinear dynamic analysis. Aside from presenting the steps in the derivations of the consistent element stiffness and mass matrices, constitutive relations of elastic materials and elasto-plastic materials with isotropic strain hardening, yield criterion, return mapping, configuration and stress updating strategies, and numerical algorithms are presented and discussed. Nonlinear dynamics of flat-surface structures are treated in Chapter 8. The cantilevered, circular, and square plates under uniform pressures, rectangular plate subjected to a center load, and a cubic tube under internal and external pressures are considered in this chapter. Chapter 9 is concerned with the nonlinear dynamics of curved-surface structures. The cylindrical panel under a central point load and under a uniform pressure, hemispheres with and without a central hole and under alternating point loads, clamped and hinged spherical caps subjected to apex point loads and under pressures are examined in this chapter. Finally, it should be mentioned that no attempt has been made to include the important subject of chaotic dynamics of plate and shell structures applying the lower order flat triangular shell finite elements. We, the authors, confirm that there is no conflict of interest in regard to contents of this book.